The story of the Cleveland Rams might be deservedly obscure if not for the franchise’s signing of quarterback Bob Waterfield in 1945 and the team’s NFL championship that fall. If you’re a podcast fan you’ll want to spend a fast-moving hour with Cleveland Rams author Jim Sulecki and “Sports’ Forgotten Heroes” host Warren Rogan as they trace the career arc of Waterfield, one of the best all-around athletes ever to play in the NFL. 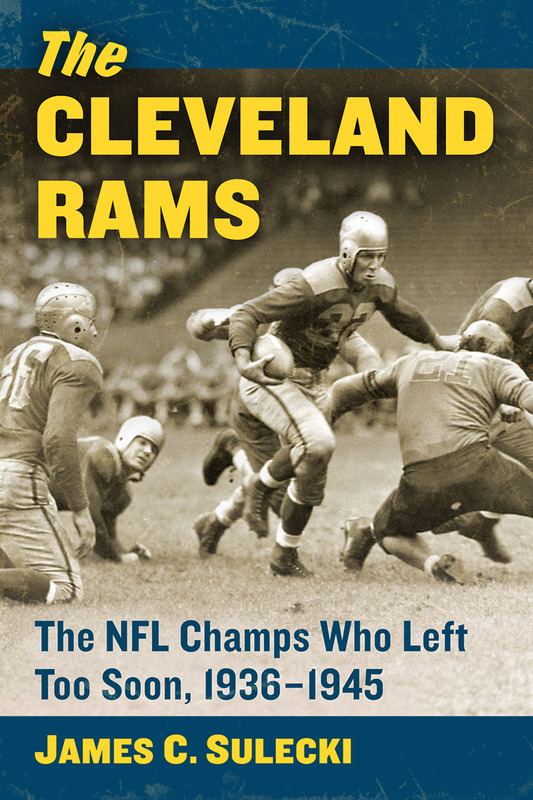 Cleveland Rams author James C. Sulecki’s appearances in the Cuyahoga Public Library’s “Ohio Sports History” series continue on Tues., Oct. 3, at the Bay Village (OH) Library. Jim’s presentation, to begin at 7:00 p.m., is titled “The Real History of the Cleveland Rams” and will be followed by questions, sales of his book, and book signings. Author appearances this fall in the Greater Cleveland area also include the Brooklyn Branch of the Cleveland Public Library, Chagrin Falls, Parma, South Euclid, and Chesterland (Geauga West). Cleveland Rams author James C. Sulecki’s appearances in the Cuyahoga Public Library’s “Ohio Sports History” series continue on Thurs., Oct. 5, at the Chagrin Falls Public Library. Author appearances this fall in the Greater Cleveland area also include the Brooklyn Branch of the Cuyahoga Public Library, Bay Village, Parma, South Euclid, and Chesterland (Geauga West). Just in time for the new season, Cleveland Rams author James C. Sulecki begins a fall author series with a Wed., Sept. 20 appearance at the Brooklyn Branch of the Cleveland Public Library. Jim’s presentation, to begin at 7:00 p.m., is titled “The Real History of the Cleveland Rams” and will be followed by questions, sales of his book, and book signings. It’s part of the Cuyahoga Public Library’s “Ohio Sports History” series. Author appearances this fall in the Greater Cleveland area also include Bay Village, Chagrin Falls, Parma, South Euclid, and Chesterland (Geauga West). How the origin story of the billion-dollar NFL Rams franchise now based in the nation’s second largest market could have been so forgotten is one of many topics covered in James C. Sulecki’s recent interview with Tim Hanlon, host and producer of Good Seats Still Available. Through the course of the 80-minute podcast, the Cleveland Rams author notes professional football is far less inclined than Major League Baseball to honor its early history, and that the NFL tends to trace its modern-era beginnings to the 1960s when it became the most popular pro sport in America. Unfortunately, this inclination leaves nearly a half-century of important early innovation mostly unforgotten In 2020 the NFL will mark the centennial of its founding in Canton, OH.